ZED-6FX delivers Allen & Heathƒ? ?s renowned build and audio excellence in a compact, portable format, making it the ideal choice for quality conscious musicians, singer / songwriters and venues. Whether itƒ? ?s bouncing ideas around at home, performing live or recording tracks to share on YouTube and Soundcloud, ZED-6FX is a versatile companion for every step of the creative journey. Featuring the new GSPre boutique preamp design, developed from the revered GS-R24 studio recording console, the ZED boasts exceptionally low noise and massive headroom, with a signature analogue warmth and depth. ZED-6FX is the first mixer to include a specially created suite of studio quality reverbs, delays and special multi-model FX, crafted by Allen & Heathƒ? ?s acclaimed in-house effects aficionados. Guitarists will be pleased to know that ZED-6FX comes with a pair of Guitar DI high impedance inputs, allowing guitars to be plugged straight into the mixer without the hassle and expense of carrying separate DI boxes. ZED-6FX features an exceptional new preamp design, created by analogue guru, Mike Griffin and developed from his highly acclaimed GS-R24 studio recording console. Known as GSPre, the preamps deliver exceptionally low noise and massive headroom, and the warmth and depth that Allen & Heathƒ? ?s analogue range is famous for. For tonal shaping, the precise MusiQ EQ controls have been carefully calibrated for responsiveness and precision, making it easy to shape and enhance each musical source. 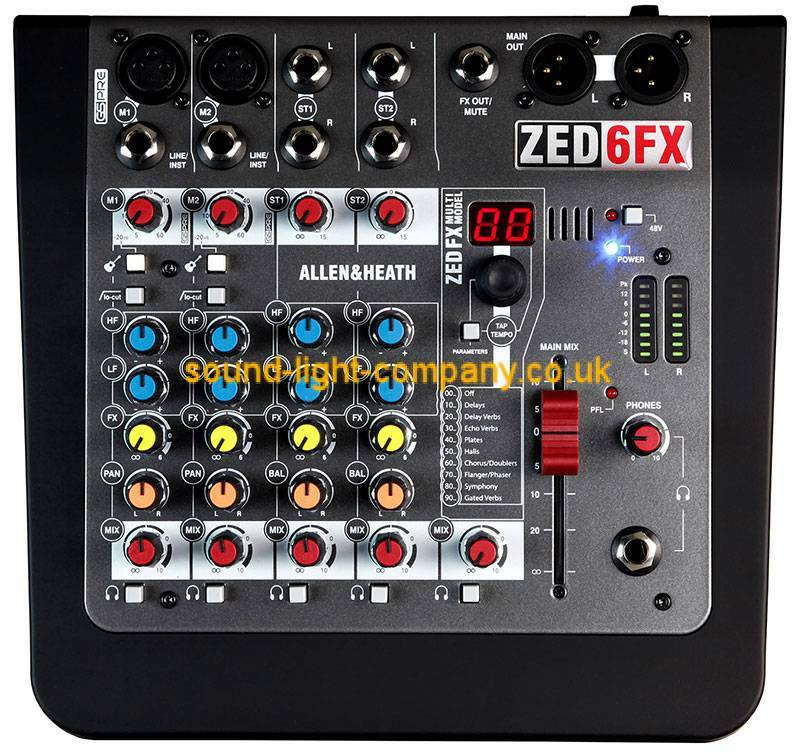 ZED-6FX comes with two Guitar DI high impedance jack inputs, allowing guitars to be plugged straight into the mixer without the need for DI boxes. Thatƒ? ?s one less piece of gear to buy, carry and set up.